This meal is from the April 24th CSA box. I tweaked the recipe of course by adding some bacon to give it a little more flavor. Leeks are pretty mild and the bacon really kicked it up a notch. I also had to cut the recipe in half because it was just me. It made a good portion for dinner one night and then a few nights later for leftover dinner. The recipe below is the full version, I pretty much eye balled everything when I cut it in half. Let’s start with the pasta. Get your pot of salted water boiling before starting anything else. There’s nothing worse than waiting for your water to boil and everything else is done. 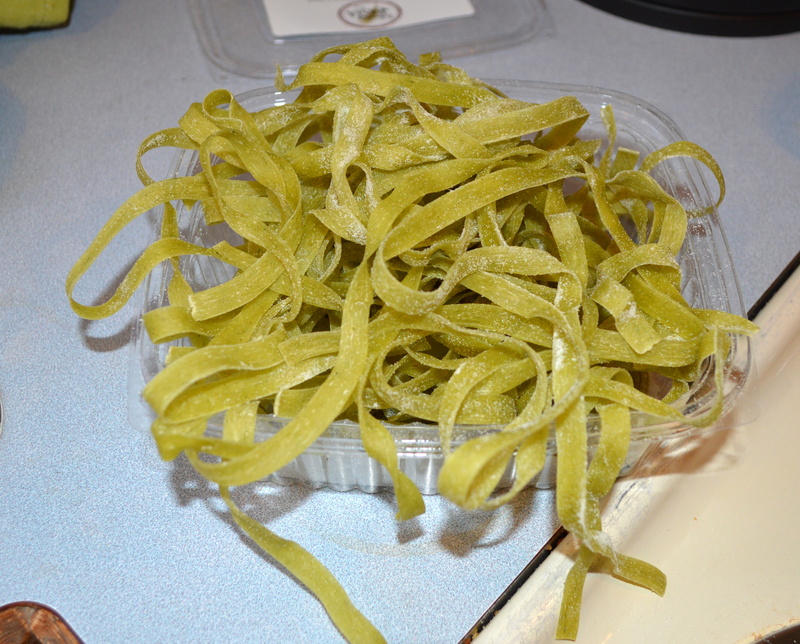 I used the fresh spinach fettuccine that was provided in the box. So good! You can use dried pasta as well. Just a few notes that I have learned using fresh pasta. Make sure you separate the pasta pieces before dumping it in the water, otherwise they will clump up and not cook evenly. Also fresh pasta doesn’t take as long to cook as dried so keep that in mind. It took about 5-6 minutes for the fettuccine to get to al dente the way I like. Saute the bacon in a large skillet over medium-high heat until browned and crispy. I say to use a large skillet because you’ll be tossing the pasta in to the sauce and you’ll want to make sure you have a large enough pan to hold it all. 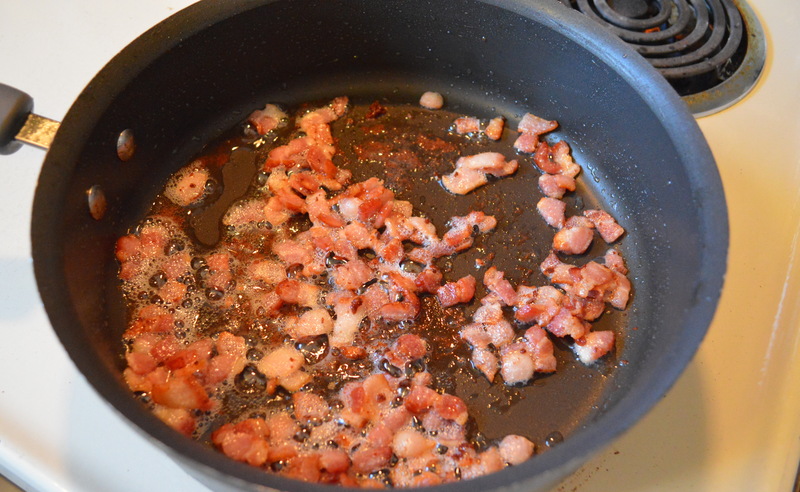 Remove the bacon from the pan, reserving about 1 tablespoon of the drippings. 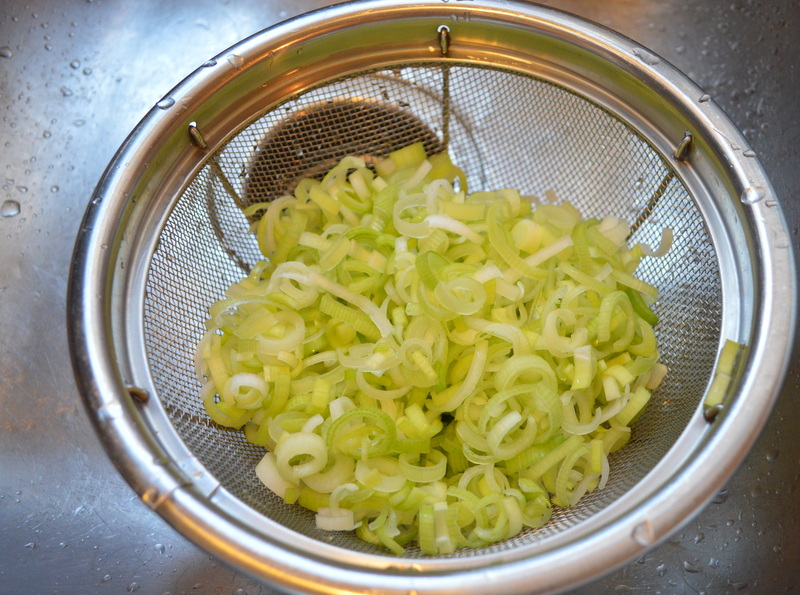 Slice the leeks lengthwise down the center and then into thin half moons (about 1/4 inch). Rinse the leeks to remove any trapped dirt. Melt 2-3 tablespoons butter in skillet over medium-low heat with reserved drippings, you should have about 3 tablespoons total. Add the leeks and cook slowly until very soft and translucent, about 5 minutes. Add 1/3 cup white wine and simmer for about 4 minutes. 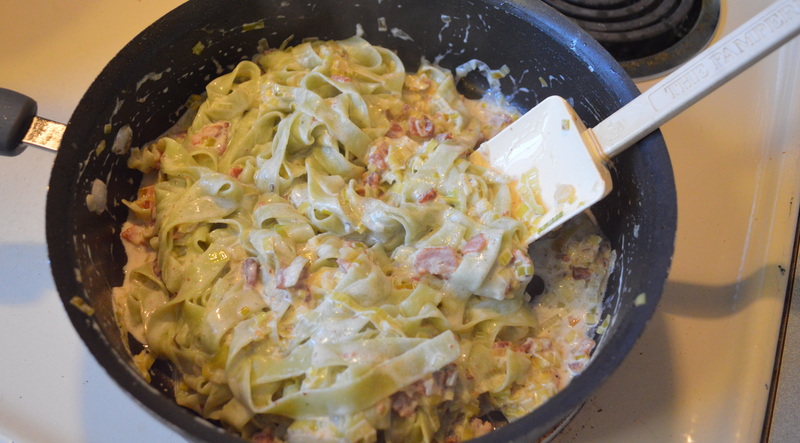 Add the cream or half & half (I used more, about 3/4 cup, so the pasta was very creamy). Simmer an additional 3-5 minutes until it starts to get a little thick. Add the cooked bacon and season with salt and pepper to taste. While the wine and cream are simmering, add your pasta to the pot and cook according to package directions. Fresh pasta about 5-6 minutes, dried pasta about 12 minutes. Just till al dente. 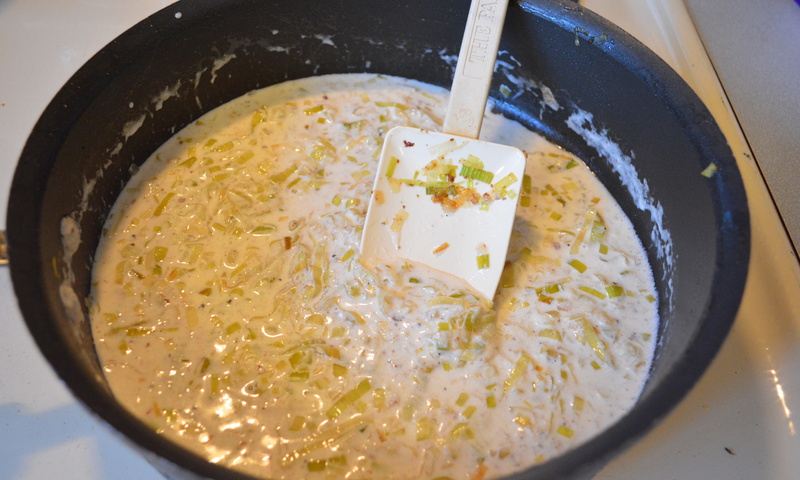 Ladle out and save 1 cup of the pasta water before draining, drain the pasta and then toss it in the skillet with the leeks and bacon mixture. Add some of the pasta water as necessary to loosen up the pasta. Top with Parmesan cheese if desired. Makes about 4 servings. Before storing the leftovers I took a bit of the leftover pasta water and stirred it in to the pasta. 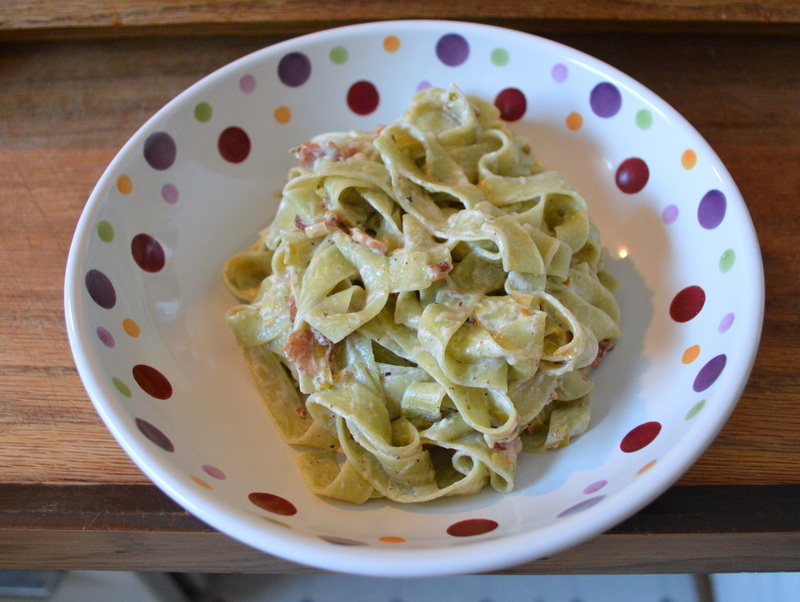 When reheating the pasta you can add a bit more cream if it is still too thick. Bring a large pot of salted water to boil. 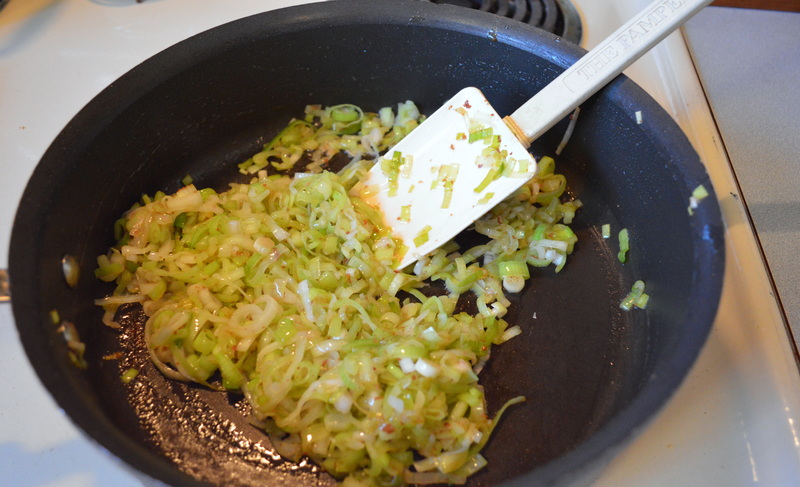 Saute bacon in large skillet over medium-high heat until browned and crispy. Remove from pan, reserving 1 tablespoon drippings. 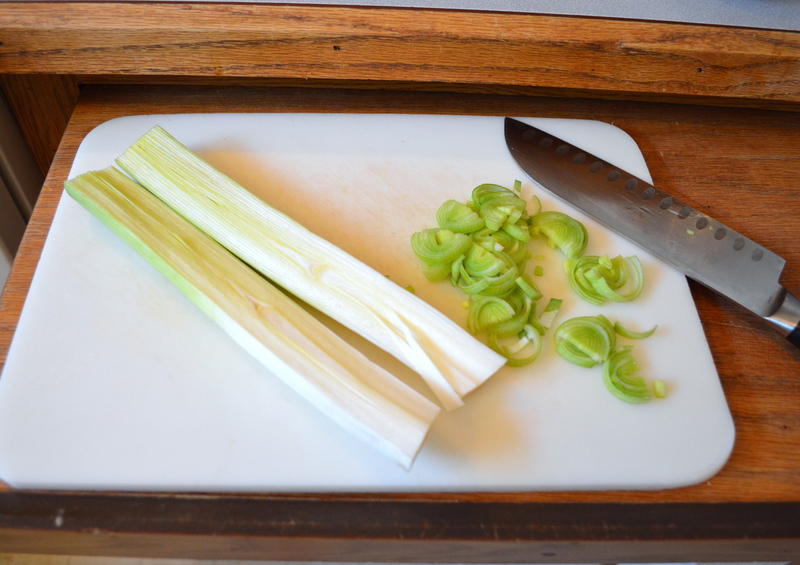 Slice the leeks lengthwise down the center and then into thin half moons (about 1/4 inch). Rinse the leeks to remove any trapped dirt. Melt 2-3 tablespoons butter in skillet over medium-low heat with reserved drippings, you should have about 3 tablespoons total. Add the leeks and cook slowly until very soft and translucent, about 5 minutes. This looks great–and I agree bacon could only make it better!